The 4th of January 2017 marks the 101 year anniversary of Frederick Selous' death. In fact this is quite a historical year for the Selous Game Reserve as it also marks the 100th year of the end of WW1, some of which was fought in our backyard. 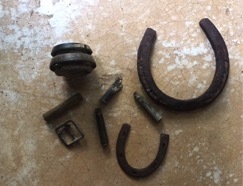 Wondering around camp, I stumbled across some bullet casings, belt buckles and a horse shoe – I know we have no horses or mules here and that zebras don’t need shoes so it is more than likely from WW1. How fascinating to be a part of this reserve with so much history attached to it!! Not only was Selous a British soldier and hunter but also one of the greatest conservationists of our time. He was a keen explorer and learnt everything he could about Africa and its people, plants and animals. He sent over 5000 specimens of African flora and fauna to the British Museum of Natural History, including an incredible selection of butterflies. In 1920 they erected a bust honoring his life as an explorer. The butterfly collection and his bust still stand in the museum today. Selous was a big game hunter but the American’ s method of hunting appalled him so much, that it made him change his attitude to hunting which is why he became a conservationist. For quite a while he had been thinking about the idea of putting limitations on the levels of hunting and providing areas to protect wildlife. In fact, he promoted a ‘licence’ system for hunting that is still present today which protects animals from rogue hunters. He spent over 30 years in the bush, hopping between UK and Africa but his heart always set on East Africa. At aged 63 he had a chance to stand up for Britain against the Germans at the 1st World War. Initially he was refused to join because of his age, but as they were needing more troops, it was decided that he could join in the end, and so he returned to German East Africa. He was a Captain in the Royal 25th Fusiliers, otherwise a unit knows as ‘the old and the bold’. His own unit which he assembled was made up of guerrilla fighters, professional hunters, French legionnaires, American cowboys, and an assortment of other characters, including an acrobat and a Honduran General. All the while still collecting butterflies. Selous was one of the fitter and healthier of the men, his only break was to be sent home in 1916 for a pile operation, during which time he was awarded the DSO. ‘CAPTAIN FC SELOUS DSO 25 ROYAL FUSILIERS, KILLED IN ACTION, 4.1.17’. In 1922, his memory was honored and the area of Selous grave fittingly became a wildlife sanctuary that later incorporated the whole of the Rufiji River and floodplain system – the SELOUS GAME RESERVE boasting an area of more than 17 000 m² (44 800 km²) along the rivers Kilombero, Ruaha, and Rufiji. 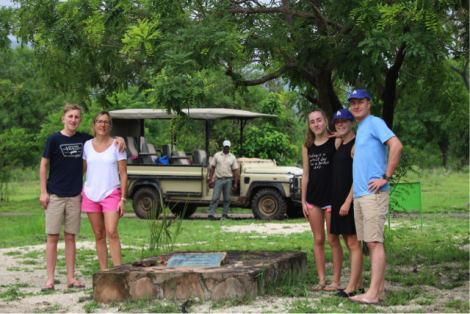 The wonderful Walsh family who just spent 5 nights with us at Sand Rivers, went to pay their respects at Frederik Selous grave on the 4th January 2018.